If there’s any reason at all to regard Playa del Carmen as something less than heaven on earth, it’s the scale of the local tourism trade. But a good boutique hotel can help you recapture some of that undiscovered-paradise feeling. 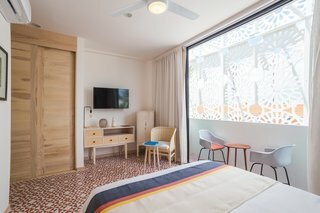 Small scale is what Hotel Morgana’s got going for it, after all: this family-owned hotel is human-sized, and each of its twenty rooms has its own design and its own personality. Themes range from the very personal “Frida,” named for the painter Frida Kahlo, to “Maiz,” which takes an agricultural inspiration. What they have in common is colorful tilework against a backdrop of soft neutrals, and some unpretentious contemporary furniture to complement the spare, modernist design sense. All come with basics like air conditioning and Nespresso machines; some feature balconies, others private Jacuzzis, and the suites are particularly spacious, with sofa beds for larger parties. A rooftop restaurant serves modern Mexican flavors with a view, and the rooftop pool with its poolside bar provides a respite from the action of Playa del Carmen. Speaking of which: 5th Avenue is just steps away, and that’s where a location in a holiday hotspot pays dividends. There’s plenty to do, from dining to drinking to water sports and archaeological tours — and a cozy, stylish little boutique hotel to return to at the end of the day.